Adapted from a case study based on Hanover Insurance Company in the book Systems Thinking, Systems Dynamic. Managing Change and Complexity by Kambiz E. Maani and Robert Y. Cavana Second Edition. We have to understand how co-operatives work and how they get frustrated, especially giant co-operatives. This is a casual loop diagram (CLD) that I will attempt to explain how especially Saccos are frustrated by lack of success and what they can do to change that. The staff of Saccos Society are usually advised to work faster and work harder and probably also take fewer or shorter breaks. Over short time these usually produce desired effects but also lead to unintended consequences. The unintended consequences are usually masked by long time delays and hidden cause and effect relationships. This could be happening now or has happened to many Sacco societies especially after opening up of the common bonds leading to growth in membership. 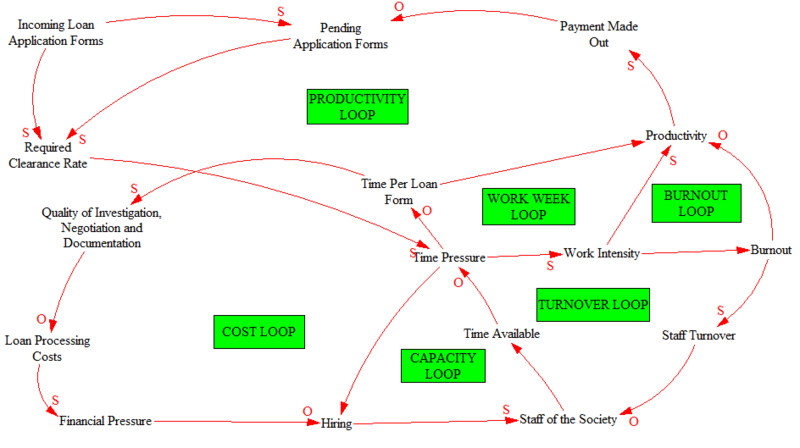 First, lets start with Productivity Loop below. As the society grows, there are more incoming loan application forms. With more loans forms to be processed i.e. categorized into different products (advance, emergency, school fees, development loans, etc), requires that the rate of clearance of these loan forms/requests has to be increased due to time pressure. This will of course lead to less time spent on loan forms and therefore higher productivity (in making payments/giving out loans) and reduced pending loan applications. This will ease pressure on required clearance rate. Second, Work Week Loop as depicted below. The increased time pressure, will lead to increased work intensity which will in turn lead to greater productivity. More members will receive their loans on/in time and of course this means more income for the society, more interest on deposit and dividends for members. Third, Burnout Loop as indicated below. As the work intensity increases, it means that the staff are working longer hours, taking fewer breaks or shorter breaks or even not taking breaks (seen some eating at their workstations!). This will lead to fatigue, burnout and poor health which has a negative effect on productivity. Simply put, more loan forms are processed but at the expense of the society’s staff who affect productivity due to quality of work they are giving members and the society. Fourth, Turnover Loop as pictured below. Persistent burnout increases staff turnover hence reduced numbers of staff in the society. People will start applying for other jobs when they do not rest or have breaks or their health start deteriorating. When the number of staff has reduced in the Sacco society, it means that the incoming loan application forms and pending loan application forms will not be cleared at the rate required unless the now fewer staff, spend even less time per loan application, i.e. work longer hours with fewer or no breaks. This will affect the quality of work as there will be inadequate time to verify information given in the loan forms by borrowers and hence increasing chances of loan defaulting or over-loaning or under-guaranteeing of loans. There will be poor documentation, staff will spend less time with members of the society and therefore no rapport will be developed with members who now have more options of joining other Saccos where they can be attended to properly. Fifth, Cost Loop as indicated below. There will be higher financial pressure on the Sacco society given that more borrowers will default and some dissatisfied members will withdraw membership and therefore loss of income and economies of scale respectively by the society. The society will be unable to recruit the right people into their staff because of financial pressure thus exacerbating the time pressure further. So far what the CLD have shown are the ‘Fixes that Fail‘, short-term fixes and their unintended consequences. As the society grows, board of directors shouldn’t be asking their staff to work harder and have fewer breaks or refuse them their annual/maternity leave, but look for fundamental strategies for dealing with increased workload. Saccos have to carry out process improvement. For example instead of board approving emergency loans and advances, this can be delegated to the employees of the society and hence saving time. Saccos can also invest in information technology; computers and software that will improve on accuracy and efficiency of operations. Despite of the financial pressure, Saccos can also hire more staff, a statement to commitment of best practice. The valuable staff should also be encouraged, developed and retained in the society. Change of board of directors shouldn’t lead to change of the staff of the society. I have seen this happening so many times. These are simple solutions, but at the ground level it is more complicated than this. But, in looking for fundamental solutions, all variables as per the context in which a particular Sacco operates must be considered and their interplay mapped and understood.